A farcical, rapid-fire comedy set in the backbiting, back-scratching, backstabbing world of CanLit. Rumours are rife and excitement is running high that Canada's pre-eminent man of letters, the august Noble Harmsworth, is on the verge of becoming the first Canadian winner of the Nobel Prize for Literature. But if the Nobel poo-bahs want to immortalize him, why does his former friend and admirer Lyle Lemmerman want to kill him? A lovestruck acolyte, a nosy critic, a dyspeptic agent, a missing manuscript (and a missing author) all contribute to the twists, turns (and laughs) in this sophisticated, suspenseful comedy about literary fame, fortune and fakery. 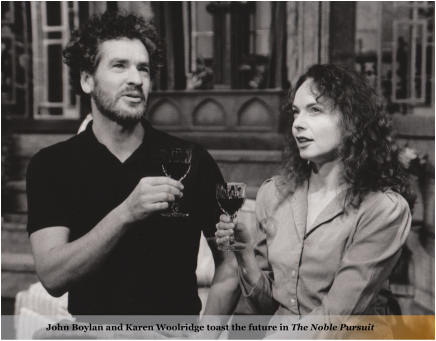 The Noble Pursuit premiered at the Thousand Islands Playhouse in 1991. Note: A newly revised and updated version (2015) of the Noble Pursuit is now available. Directed by Simon Johnston; Designed by David Juby. Directed by Greg Wanless; Designed by Jack Boschman. 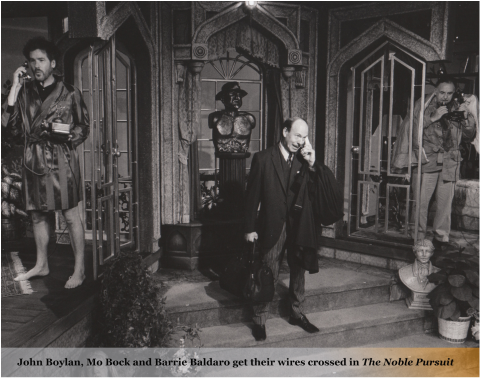 "There's lots to laugh about in The Noble Pursuit ... What was really enjoyable, aside from Bowie's relentlessly witty script and some great performances, was the physical comedy, mistaken identities, near misses and the like which works seamlessly ... a lot of fun." ~ The Kingston Whig-Standard (2015)"